Happy July to you! Can you believe we are more than halfway through another year? I have heard the older you get, the faster time goes and I am certainly a witness to that! 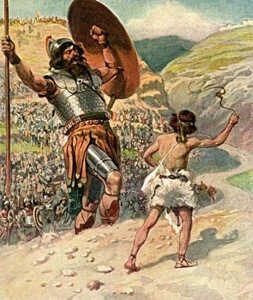 Anyway, I’d like to share a classic Bible story with you–David and Goliath. While many of us know and remember the story from Sunday School, I was recently reminded of the spiritual significance. Meanwhile, the word tells us the Israelites were dismayed and greatly afraid! These were the same people who experienced the blessings (and punishment) of God, but likely because Goliath was so big (almost ten feet) weighted with all that armor, and so confident, he frightened his opponents so NO one wanted to fight him. That is until David, a youthful shepard came by, heard Goliath, and was incensed that he would defy the army of the living God. David went to Goliath with no armour, rather with The Lord on his side, and a rock to Goliath’s forehead. As I was reading this story, a couple of things came to me. Notice Goliath never touched the Israelites—he just spoke to them and they fell to pieces. In comparison, the adversary is a type of Goliath. He taunts, accuses, brings feelings of doubt, fear, worry —sometimes paralyzing us so we fall apart and we will not fight. We allow the enemy to stop us from doing what God called us to. We draw back when we notice the stern, unsmiling faces at church when we speak. We stop praising God freely because someone is looking at us. We stay out of the prayer line fearing the congregation will be wondering why we are up for prayer–again. We think,”what if God doesn’t…..” or “maybe people will laugh” or “what if I mess up?” The list can go on and on, but you get the picture. Proverbs 29:25 reminds us, the fear of man brings a snare, but whoever trusts in the Lord shall be safe. Whose side are we trusting on? Also, while what we feel may be real, we have to recall what David said to Goliath: You come to me with a sword, and with a spear, and with a shield: but I come to you in the name of the Lord of hosts, the God of the armies of Israel, whom thou has defied (1 Samuel 17:45). David had total confidence in God and the ability God gave Him. AND David didn’t have the Holy Ghost, but WE do. We’ve got THE power in the name of Jesus, we just have to use it! Also, while we do not wrestle against flesh and blood (no stones needed) 😄, we do wrestle against principalities, powers, the rulers of the darkness of this world, and spiritual wickedness in high places (Ephesians 6:12). Those battles are fought and won with fasting, prayer, reading your Word, and knowing that our God is God! While things may not go the way we want them, God in His infinite wisdom has won every battle–the fight is fixed! Bottom line: while there are some “Goliaths” in all our lives from time to time, those of us who are Holy Ghost filled have the privilege to know the same God on whom David relied, is the same one we can call on for help. Psalms 98:1 reminds us His [God’s] right hand and His holy arm has gotten Him the victory. Because He lives in You, you can rest in knowing God is working on your behalf to ensure you will be victorious, according to His will! Fight on! Thanks for reading and may God bless you richly!